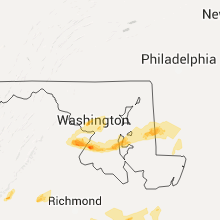 The Port Tobacco Village, MD area has had 0 reports of on-the-ground hail by trained spotters, and has been under severe weather warnings 34 times during the past 12 months. Doppler radar has detected hail at or near Port Tobacco Village, MD on 20 occasions, including 4 occasions during the past year. 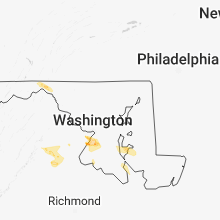 4/15/2019 2:20 AM EDT The severe thunderstorm warning for southern prince georges and charles counties will expire at 230 am edt, the storm which prompted the warning has moved out of the area. therefore, the warning will be allowed to expire. 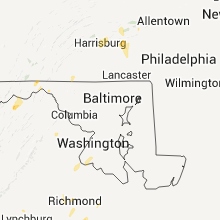 a tornado watch remains in effect until 400 am edt for southern and central maryland. to report severe weather, contact your nearest law enforcement agency. they will relay your report to the national weather service sterling virginia. 4/15/2019 1:47 AM EDT At 146 am edt, a severe thunderstorm was located 8 miles northwest of la plata, moving northeast at 60 mph (radar indicated. at 1:35 am, 63 mph wind gust was recorded at fredericksburg, va). Hazards include 70 mph wind gusts. Damaging winds will cause some trees and large branches to fall. this could injure those outdoors, as well as damage homes and vehicles. roadways may become blocked by downed trees. localized power outages are possible. Unsecured light objects may become projectiles. 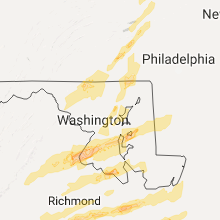 4/8/2019 5:53 PM EDT At 552 pm edt, severe thunderstorms were located along a line extending from near clinton to near waldorf, moving east at 50 mph. the buoy at cobb point gusted to 59 mph at 5:47 pm (measured gusts). Hazards include 60 mph wind gusts. Damaging winds will cause some trees and large branches to fall. this could injure those outdoors, as well as damage homes and vehicles. roadways may become blocked by downed trees. localized power outages are possible. unsecured light objects may become projectiles. Locations impacted include, waldorf, clinton, fort washington, lexington park, chesapeake ranch estates, la plata, chesapeake beach, deale, king george, leonardtown, dahlgren, prince frederick, piney point, tall timbers, saint inigoes creek, popes creek, hallowing point, saint leonard creek, town creek and sheridan point. 4/8/2019 5:46 PM EDT At 546 pm edt, severe thunderstorms were located along a line extending from near saint charles to near waldorf, moving east at 50 mph (radar indicated). Hazards include 60 mph wind gusts. Damaging winds will cause some trees and large branches to fall. this could injure those outdoors, as well as damage homes and vehicles. roadways may become blocked by downed trees. localized power outages are possible. Unsecured light objects may become projectiles. 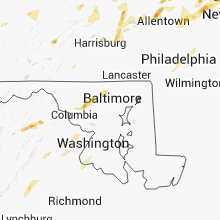 3/22/2019 4:46 PM EDT At 445 pm edt, a severe thunderstorm with a history of producing 60 mph wind gusts and wind damage was located near dunkirk, or 9 miles west of chesapeake beach, moving east at 40 mph (trained weather spotters, emergency management and measured wind gusts). Hazards include 60 mph wind gusts. Damaging winds will cause some trees and large branches to fall. this could injure those outdoors, as well as damage homes and vehicles. roadways may become blocked by downed trees. localized power outages are possible. unsecured light objects may become projectiles. Locations impacted include, waldorf, dale city, lexington park, chesapeake ranch estates, la plata, mayo, shady side, chesapeake beach, deale, leonardtown, prince frederick, piney point, quantico, tall timbers, saint inigoes creek, hallowing point, saint leonard creek, town creek, sheridan point and saint clements bay. 3/22/2019 4:21 PM EDT At 421 pm edt, a severe thunderstorm was located over fort washington, moving southeast at 40 mph (emergency management, spotters and measured wind gusts). Hazards include 60 mph wind gusts. Damaging winds will cause some trees and large branches to fall. this could injure those outdoors, as well as damage homes and vehicles. roadways may become blocked by downed trees. localized power outages are possible. Unsecured light objects may become projectiles. 11/2/2018 10:06 PM EDT At 1006 pm edt, severe thunderstorms were located along a line extending from near nanjemoy creek to near king george to near fort a.p. hill, moving northeast at 40 mph (radar indicated). Hazards include 60 mph wind gusts. Damaging winds will cause some trees and large branches to fall. this could injure those outdoors, as well as damage homes and vehicles. roadways may become blocked by downed trees. localized power outages are possible. Unsecured light objects may become projectiles. 9/4/2018 4:52 PM EDT The severe thunderstorm warning for central charles and northeastern king george counties will expire at 500 pm edt, the storm which prompted the warning has weakened below severe limits, and no longer pose an immediate threat to life or property. therefore the warning will be allowed to expire. however gusty winds and heavy rain are still possible with this thunderstorm. to report severe weather, contact your nearest law enforcement agency. they will relay your report to the national weather service sterling virginia. 9/4/2018 4:34 PM EDT At 433 pm edt, a severe thunderstorm was located over port tobacco river, moving southwest at 10 mph (radar indicated). Hazards include 60 mph wind gusts. Damaging winds will cause some trees and large branches to fall. this could injure those outdoors, as well as damage homes and vehicles. roadways may become blocked by downed trees. localized power outages are possible. unsecured light objects may become projectiles. Locations impacted include, la plata, dahlgren, nanjemoy creek, port tobacco river, popes creek, port tobacco village, newburg, dentsville, port tobacco, faulkner and bel alton. 9/4/2018 4:11 PM EDT At 411 pm edt, a severe thunderstorm was located near la plata, moving southwest at 15 mph (radar indicated). Hazards include 60 mph wind gusts. Damaging winds will cause some trees and large branches to fall. this could injure those outdoors, as well as damage homes and vehicles. roadways may become blocked by downed trees. localized power outages are possible. Unsecured light objects may become projectiles. 9/4/2018 4:04 PM EDT At 403 pm edt, a severe thunderstorm was located over la plata, moving south at 10 mph (radar indicated). Hazards include 60 mph wind gusts. Damaging winds will cause some trees and large branches to fall. this could injure those outdoors, as well as damage homes and vehicles. roadways may become blocked by downed trees. localized power outages are possible. unsecured light objects may become projectiles. Locations impacted include, waldorf, la plata, saint charles, pomfret, port tobacco village, port tobacco and white plains. 9/4/2018 3:49 PM EDT At 349 pm edt, a severe thunderstorm was located over la plata, moving southwest at 10 mph (radar indicated). Hazards include 60 mph wind gusts and quarter size hail. Damaging winds will cause some trees and large branches to fall. this could injure those outdoors, as well as damage homes and vehicles. roadways may become blocked by downed trees. localized power outages are possible. Unsecured light objects may become projectiles. 8/12/2018 5:09 PM EDT The national weather service in sterling virginia has issued a * severe thunderstorm warning for. northwestern st. marys county in southern maryland. calvert county in southern maryland. southeastern prince georges county in central maryland. Charles county in southern maryland. 8/12/2018 4:56 PM EDT At 456 pm edt, a severe thunderstorm was located near nanjemoy creek, moving east at 15 mph (radar indicated). Hazards include 60 mph wind gusts and quarter size hail. Damaging winds will cause some trees and large branches to fall. this could injure those outdoors, as well as damage homes and vehicles. roadways may become blocked by downed trees. localized power outages are possible. unsecured light objects may become projectiles. Locations impacted include, waldorf, la plata, port tobacco river, popes creek, saint charles, wicomico, bryans road, hughesville, cobb island, bryantown, pomfret, rock point, port tobacco village, issue, tompkinsville, ironsides, bel alton, swan point, pisgah and faulkner. 8/12/2018 4:27 PM EDT At 427 pm edt, a severe thunderstorm was located over aquia creek, moving east at 15 mph (radar indicated). Hazards include 60 mph wind gusts and quarter size hail. Damaging winds will cause some trees and large branches to fall. this could injure those outdoors, as well as damage homes and vehicles. roadways may become blocked by downed trees. localized power outages are possible. Unsecured light objects may become projectiles. 8/7/2018 6:13 PM EDT At 613 pm edt, a severe thunderstorm was located 7 miles west of la plata, moving northeast at 15 mph (radar indicated). Hazards include 60 mph wind gusts and quarter size hail. Damaging winds will cause some trees and large branches to fall. this could injure those outdoors, as well as damage homes and vehicles. roadways may become blocked by downed trees. localized power outages are possible. Unsecured light objects may become projectiles. 5/22/2018 5:08 PM EDT At 508 pm edt, a severe thunderstorm was located over fort belvoir, moving southeast at 25 mph (radar indicated). Hazards include 70 mph wind gusts. Damaging winds will cause some trees and large branches to fall. this could injure those outdoors, as well as damage homes and vehicles. roadways may become blocked by downed trees. localized power outages are possible. Unsecured light objects may become projectiles. 5/14/2018 7:24 PM EDT The severe thunderstorm warning for central prince georges, charles and king george counties will expire at 730 pm edt, the storms which prompted the warning were moving out of the area. therefore the warning will be allowed to expire. 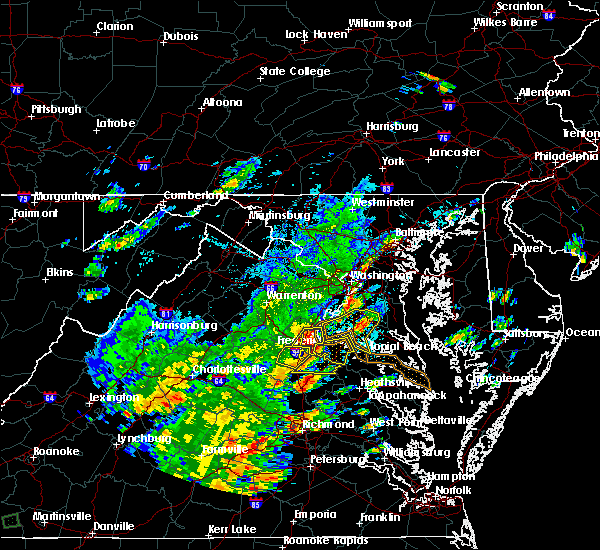 however gusty winds and heavy rain are still possible with thunderstorms as they move east toward the chesapeake bay. 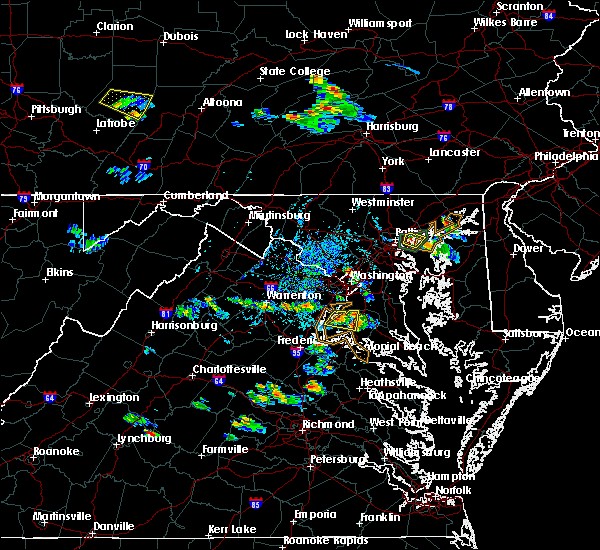 a severe thunderstorm watch remains in effect until 900 pm edt for southern and central maryland, and northern and central virginia. 5/14/2018 7:04 PM EDT At 704 pm edt, severe thunderstorms with a history of producing damaging winds and hail were located along a line extending from near clinton to near la plata to fairview beach, moving southeast at 45 mph (radar indicated). Hazards include 70 mph wind gusts and quarter size hail. Damaging winds will cause some trees and large branches to fall. this could injure those outdoors, as well as damage homes and vehicles. roadways may become blocked by downed trees. localized power outages are possible. unsecured light objects may become projectiles. Locations impacted include, waldorf, bowie, clinton, fort washington, forestville, largo, coral hills, la plata, king george, national harbor, dahlgren, upper marlboro, fairview beach, nanjemoy creek, popes creek, fedex field, port tobacco river, andrews air force base, landover and camp springs. 5/14/2018 6:33 PM EDT At 633 pm edt, severe thunderstorms were located along a line extending from tysons corner to near woodbridge to 10 miles southeast of bealeton, moving southeast at 45 mph (radar indicated). Hazards include 70 mph wind gusts and half dollar size hail. Damaging winds will cause some trees and large branches to fall. this could injure those outdoors, as well as damage homes and vehicles. roadways may become blocked by downed trees. localized power outages are possible. Unsecured light objects may become projectiles. 5/12/2018 9:55 PM EDT At 954 pm edt, severe thunderstorms were located near la plata, moving southeast at 35 mph (radar indicated). Hazards include 60 mph wind gusts and quarter to golf ball size hail. Damaging winds will cause some trees and large branches to fall. this could injure those outdoors, as well as damage homes and vehicles. roadways may become blocked by downed trees. localized power outages are possible. unsecured light objects may become projectiles. Locations impacted include, waldorf, lexington park, chesapeake ranch estates, la plata, leonardtown, prince frederick, piney point, tall timbers, saint inigoes creek, saint marys city, greenwell state park, hallowing point, saint leonard creek, town creek, wicomico river, saint marys river, white point beach, cuckold creek, saint george island and sheridan point. 5/12/2018 9:37 PM EDT At 936 pm edt, severe thunderstorms were located along a line extending from near leonardtown to near colonial beach, moving south at 35 mph (radar indicated). Hazards include 60 mph wind gusts and quarter size hail. Damaging winds will cause some trees and large branches to fall. this could injure those outdoors, as well as damage homes and vehicles. roadways may become blocked by downed trees. localized power outages are possible. unsecured light objects may become projectiles. Locations impacted include, waldorf, lexington park, chesapeake ranch estates, la plata, leonardtown, prince frederick, piney point, tall timbers, saint inigoes creek, hallowing point, saint leonard creek, town creek, sheridan point, saint clements bay, saint marys city, greenwell state park, wicomico river, saint marys river, white point beach and cuckold creek. 5/12/2018 8:47 PM EDT At 847 pm edt, severe thunderstorms were located along a line extending from near rosaryville to 8 miles west of la plata, moving south at 35 mph (radar indicated). Hazards include 60 mph wind gusts and quarter to golf ball size hail. Damaging winds will cause some trees and large branches to fall. this could injure those outdoors, as well as damage homes and vehicles. roadways may become blocked by downed trees. localized power outages are possible. Unsecured light objects may become projectiles. 4/16/2018 2:12 AM EDT At 212 am edt, a severe thunderstorm was located over popes creek, moving north at 50 mph (radar indicated). Hazards include 60 mph wind gusts. Damaging winds will cause some trees and large branches to fall. this could injure those outdoors, as well as damage homes and vehicles. roadways may become blocked by downed trees. localized power outages are possible. Unsecured light objects may become projectiles. 8/21/2017 4:24 PM EDT The severe thunderstorm warning for north central charles county will expire at 430 pm edt, the severe thunderstorm which prompted the warning has weakened somewhat. ea. therefore, the warning will be allowed to expire. however small hail, gusty winds and heavy rain are still possible with this thunderstorm. 8/21/2017 4:14 PM EDT At 414 pm edt, a severe thunderstorm was located near la plata, moving east at 15 mph (radar indicated). Hazards include 60 mph wind gusts and quarter size hail. Damaging winds will cause some trees and large branches to fall. this could injure those outdoors, as well as damage homes and vehicles. roadways may become blocked by downed trees. localized power outages are possible. unsecured light objects may become projectiles. Locations impacted include, waldorf, la plata, saint charles, pomfret, port tobacco village, port tobacco, ripley and bel alton. 8/21/2017 4:05 PM EDT At 404 pm edt, a severe thunderstorm was located 7 miles east of quantico, moving east at 5 mph (radar indicated). Hazards include 60 mph wind gusts and quarter size hail. Damaging winds will cause some trees and large branches to fall. this could injure those outdoors, as well as damage homes and vehicles. roadways may become blocked by downed trees. localized power outages are possible. unsecured light objects may become projectiles. Locations impacted include, waldorf, la plata, saint charles, accokeek, bryans road, mason neck, potomac heights, pomfret, port tobacco village, marbury, port tobacco, ripley, rison, pisgah and bel alton. 8/21/2017 3:44 PM EDT At 344 pm edt, a severe thunderstorm was located near quantico, moving east at 5 mph (radar indicated). Hazards include 60 mph wind gusts and quarter size hail. Damaging winds will cause some trees and large branches to fall. this could injure those outdoors, as well as damage homes and vehicles. roadways may become blocked by downed trees. localized power outages are possible. Unsecured light objects may become projectiles. 8/18/2017 6:02 PM EDT At 602 pm edt, a severe thunderstorm was located near port tobacco river, moving east at 15 mph (radar indicated). Hazards include 60 mph wind gusts. Damaging winds will cause some trees and large branches to fall. this could injure those outdoors, as well as damage homes and vehicles. roadways may become blocked by downed trees. localized power outages are possible. unsecured light objects may become projectiles. Locations impacted include, waldorf, la plata, saint charles, bryantown, pomfret, port tobacco village, dentsville, port tobacco, white plains and bel alton. 8/18/2017 5:49 PM EDT At 548 pm edt, a severe thunderstorm was located near port tobacco river, moving east at 20 mph (radar indicated). Hazards include 60 mph wind gusts and quarter size hail. Damaging winds will cause some trees and large branches to fall. this could injure those outdoors, as well as damage homes and vehicles. roadways may become blocked by downed trees. localized power outages are possible. unsecured light objects may become projectiles. Locations impacted include, waldorf, la plata, port tobacco river, saint charles, bryantown, pomfret, port tobacco village, dentsville, port tobacco, white plains, ironsides, bel alton and welcome. 8/18/2017 5:29 PM EDT At 529 pm edt, a severe thunderstorm was located near port tobacco river, moving east at 25 mph (radar indicated). Hazards include 60 mph wind gusts. Damaging winds will cause some trees and large branches to fall. this could injure those outdoors, as well as damage homes and vehicles. roadways may become blocked by downed trees. localized power outages are possible. Unsecured light objects may become projectiles. 5/25/2017 5:18 PM EDT At 517 pm edt, severe thunderstorms were located along a line extending from near la plata to near sheridan point, moving northeast at 30 mph (radar indicated). Hazards include 60 mph wind gusts and quarter size hail. Damaging winds will cause some trees and large branches to fall. this could injure those outdoors, as well as damage homes and vehicles. roadways may become blocked by downed trees. localized power outages are possible. unsecured light objects may become projectiles. Locations impacted include, waldorf, clinton, fort washington, forestville, largo, coral hills, la plata, chesapeake beach, deale, prince frederick, upper marlboro, greenwell state park, hallowing point, saint leonard creek, breezy point, sheridan point, calvert cliffs, flag harbor, andrews air force base and camp springs. 5/25/2017 5:08 PM EDT The severe thunderstorm warning for west central st. marys, southwestern charles, stafford and northern king george counties will expire at 515 pm edt, the severe thunderstorm which prompted the warning has moved out of the warned area. therefore, the warning will be allowed to expire. 5/25/2017 5:04 PM EDT At 504 pm edt, severe thunderstorms were located along a line extending from 6 miles west of port tobacco river to near leonardtown, moving northeast at 35 mph (radar indicated). Hazards include 60 mph wind gusts and quarter size hail. Damaging winds will cause some trees and large branches to fall. this could injure those outdoors, as well as damage homes and vehicles. roadways may become blocked by downed trees. localized power outages are possible. Unsecured light objects may become projectiles. 5/25/2017 4:47 PM EDT At 447 pm edt, a severe thunderstorm was located near colonial beach, moving northeast at 20 mph (radar indicated). Hazards include 60 mph wind gusts and quarter size hail. Damaging winds will cause some trees and large branches to fall. this could injure those outdoors, as well as damage homes and vehicles. roadways may become blocked by downed trees. localized power outages are possible. unsecured light objects may become projectiles. Locations impacted include, la plata, king george, dahlgren, fairview beach, nanjemoy creek, popes creek, port tobacco river, wicomico river, wicomico, cobb island, rock point, port tobacco village, bushwood, clements, issue, potomac beach, tompkinsville, weedonville, chaptico and ninde. 5/25/2017 4:26 PM EDT At 426 pm edt, a severe thunderstorm was located near port royal, or near king george, moving northeast at 20 mph (radar indicated). Hazards include 60 mph wind gusts and quarter size hail. Damaging winds will cause some trees and large branches to fall. this could injure those outdoors, as well as damage homes and vehicles. roadways may become blocked by downed trees. localized power outages are possible. Unsecured light objects may become projectiles. 5/5/2017 8:38 AM EDT At 837 am edt, severe thunderstorms were located along a line extending from tysons corner to golden beach, moving north at 60 mph (radar indicated). Hazards include 70 mph wind gusts. Damaging winds will cause some trees and large branches to fall. this could injure those outdoors, as well as damage homes and vehicles. roadways may become blocked by downed trees. localized power outages are possible. unsecured light objects may become projectiles. Locations impacted include, waldorf, dale city, annandale, clinton, springfield, fort washington, fort hunt, groveton, la plata, fort belvoir, woodbridge, popes creek, port tobacco river, lake ridge, burke, lincolnia, montclair, lorton, franconia and hybla valley. 5/5/2017 8:22 AM EDT At 821 am edt, severe thunderstorms were located along a line extending from near lake ridge to near wicomico river, moving northeast at 50 mph (observed wind of 70 mph at dahlgren at 8:20am). Hazards include 70 mph wind gusts. Damaging winds will cause some trees and large branches to fall. this could injure those outdoors, as well as damage homes and vehicles. roadways may become blocked by downed trees. localized power outages are possible. unsecured light objects may become projectiles. Locations impacted include, waldorf, dale city, annandale, clinton, springfield, fort washington, fort hunt, groveton, la plata, fort belvoir, woodbridge, popes creek, port tobacco river, lake ridge, burke, lincolnia, montclair, lorton, franconia and hybla valley. 5/5/2017 8:10 AM EDT At 809 am edt, severe thunderstorms were located along a line extending from lake ridge to near colonial beach, moving northeast at 60 mph (radar indicated). Hazards include 60 mph wind gusts. Damaging winds will cause some trees and large branches to fall. this could injure those outdoors, as well as damage homes and vehicles. roadways may become blocked by downed trees. localized power outages are possible. unsecured light objects may become projectiles. Locations impacted include, waldorf, dale city, annandale, clinton, springfield, fort washington, fort hunt, groveton, la plata, fort belvoir, woodbridge, dahlgren, quantico, nanjemoy creek, popes creek, port tobacco river, lake ridge, burke, lincolnia and montclair. 5/5/2017 7:49 AM EDT At 749 am edt, severe thunderstorms were located along a line extending from near stafford to 6 miles southeast of fort a.p. hill, moving north at 60 mph (radar indicated). Hazards include 60 mph wind gusts. Damaging winds will cause some trees and large branches to fall. this could injure those outdoors, as well as damage homes and vehicles. roadways may become blocked by downed trees. localized power outages are possible. Unsecured light objects may become projectiles. 4/6/2017 12:09 PM EDT At 1208 pm edt, a severe thunderstorm was located near port tobacco river, moving northeast at 40 mph (radar indicated). Hazards include 60 mph wind gusts and quarter size hail. Damaging winds will cause some trees and large branches to fall. this could injure those outdoors, as well as damage homes and vehicles. roadways may become blocked by downed trees. localized power outages are possible. unsecured light objects may become projectiles. Locations impacted include, waldorf, la plata, port tobacco river, popes creek, saint charles, hughesville, bryantown, pomfret, port tobacco village, dentsville, port tobacco, white plains, bel alton, newburg, welcome and faulkner. 4/6/2017 11:46 AM EDT At 1145 am edt, a severe thunderstorm was located over king george, moving northeast at 45 mph (radar indicated). Hazards include 60 mph wind gusts and quarter size hail. Damaging winds will cause some trees and large branches to fall. this could injure those outdoors, as well as damage homes and vehicles. roadways may become blocked by downed trees. localized power outages are possible. unsecured light objects may become projectiles. Locations impacted include, waldorf, la plata, king george, dahlgren, fairview beach, nanjemoy creek, popes creek, port tobacco river, saint charles, bryans road, hughesville, passapatanzy, bryantown, pomfret, port tobacco village, weedonville, ironsides, bel alton, faulkner and berthaville. 4/6/2017 11:41 AM EDT At 1141 am edt, a severe thunderstorm was located over king george, moving northeast at 40 mph (radar indicated). Hazards include 60 mph wind gusts and quarter size hail. Damaging winds will cause some trees and large branches to fall. this could injure those outdoors, as well as damage homes and vehicles. roadways may become blocked by downed trees. localized power outages are possible. Unsecured light objects may become projectiles. 3/1/2017 1:56 PM EST At 156 pm est, severe thunderstorms were located along a line extending from 6 miles southeast of fort belvoir to popes creek to near port royal, moving east at 65 mph (radar indicated). Hazards include 70 mph wind gusts. Damaging winds will cause some trees and large branches to fall. this could injure those outdoors, as well as damage homes and vehicles. roadways may become blocked by downed trees. localized power outages are possible. unsecured light objects may become projectiles. Locations impacted include, waldorf, lexington park, chesapeake ranch estates, la plata, chesapeake beach, king george, leonardtown, dahlgren, prince frederick, piney point, tall timbers, fairview beach, saint inigoes creek, popes creek, hallowing point, saint leonard creek, town creek, sheridan point, saint clements bay and nanjemoy creek. 3/1/2017 1:36 PM EST At 135 pm est, severe thunderstorms were located along a line extending from near montclair to near aquia creek to 6 miles northwest of ladysmith, moving east at 70 mph (radar indicated). Hazards include 70 mph wind gusts. Damaging winds will cause some trees and large branches to fall. this could injure those outdoors, as well as damage homes and vehicles. roadways may become blocked by downed trees. localized power outages are possible. Unsecured light objects may become projectiles. 2/25/2017 3:03 PM EST At 303 pm est, a severe thunderstorm capable of producing a tornado was located over la plata, moving northeast at 50 mph (radar indicated rotation). Hazards include tornado. For those in the direct path of a tornado touchdown, flying debris will be dangerous to those caught without shelter. damage to roofs, siding, and windows may occur. mobile homes may be damaged or destroyed. tree damage is likely. this dangerous storm will be near, waldorf around 310 pm est. chesapeake beach, breezy point and dunkirk around 330 pm est. Other locations impacted by this tornadic thunderstorm include lower marlboro, baden, aquasco, pomfret, port tobacco, sunderland, white plains, bryantown, port tobacco village and friendship. 2/25/2017 2:58 PM EST At 257 pm est, a severe thunderstorm was located near port tobacco river, moving northeast at 55 mph (radar indicated). Hazards include 70 mph wind gusts and ping pong ball size hail. Damaging winds will cause some trees and large branches to fall. this could injure those outdoors, as well as damage homes and vehicles. roadways may become blocked by downed trees. localized power outages are possible. unsecured light objects may become projectiles. Locations impacted include, waldorf, la plata, shady side, chesapeake beach, deale, prince frederick, breezy point, port tobacco river, dunkirk, saint charles, accokeek, bryans road, brandywine, huntingtown, hughesville, owings, baden, charlotte hall, potomac heights and aquasco. 2/25/2017 2:52 PM EST At 252 pm est, a severe thunderstorm was located near quantico, moving northeast at 55 mph (radar indicated). Hazards include 70 mph wind gusts and ping pong ball size hail. Damaging winds will cause some trees and large branches to fall. this could injure those outdoors, as well as damage homes and vehicles. roadways may become blocked by downed trees. localized power outages are possible. Unsecured light objects may become projectiles. 9/28/2016 5:50 AM EDT At 550 am edt, a severe thunderstorm was located over la plata, moving east at 25 mph (radar indicated). Hazards include 60 mph wind gusts and quarter size hail. Damaging winds will cause some trees and large branches to fall. this could injure those outdoors, as well as damage homes and vehicles. roadways may become blocked by downed trees. localized power outages are possible. Unsecured light objects may become projectiles. 8/17/2016 9:50 PM EDT The severe thunderstorm warning for charles, southern prince georges, northwestern st. marys and southern fairfax counties will expire at 1000 pm edt, the storm which prompted the warning has weakened below severe limits, and have exited the warned area. therefore the warning will be allowed to expire. 8/17/2016 9:36 PM EDT At 936 pm edt, a severe thunderstorm was located near quantico, moving east at 25 mph (radar indicated). Hazards include 60 mph wind gusts. Damaging winds will cause some trees and large branches to fall. this could injure those outdoors, as well as damage homes and vehicles. roadways may become blocked by downed trees. localized power outages are possible. unsecured light objects may become projectiles. Locations impacted include, waldorf, la plata, port tobacco river, golden beach, saint charles, accokeek, bryans road, brandywine, hughesville, baden, mason neck, mechanicsville, charlotte hall, potomac heights, bryantown, pomfret, port tobacco village, port tobacco, pisgah and welcome. 8/17/2016 9:17 PM EDT At 917 pm edt, a severe thunderstorm was located over quantico, moving east at 25 mph (radar indicated). Hazards include 60 mph wind gusts. Damaging winds will cause some trees and large branches to fall. this could injure those outdoors, as well as damage homes and vehicles. roadways may become blocked by downed trees. localized power outages are possible. Unsecured light objects may become projectiles. 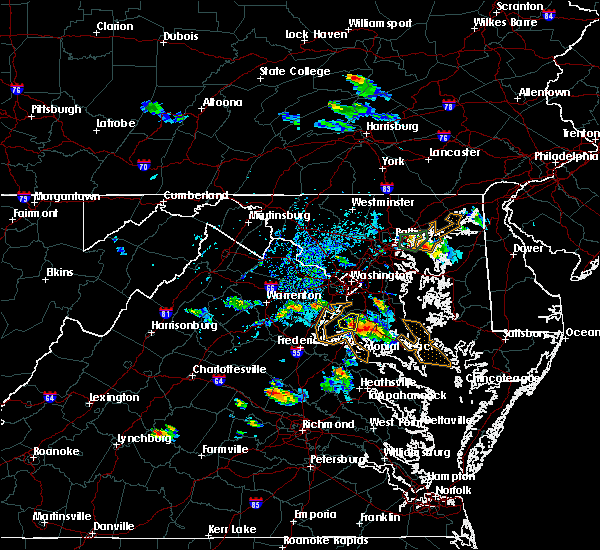 7/18/2016 4:35 PM EDT At 434 pm edt, severe thunderstorms were located along a line extending from 7 miles south of fort hunt to near dahlgren, moving east at 40 mph (radar indicated). Hazards include 60 mph wind gusts...particularly in a gust front ahead of the rain. Damaging winds will cause some trees and large branches to fall. this could injure those outdoors, as well as damage homes and vehicles. roadways may become blocked by downed trees. localized power outages are possible. unsecured light objects may become projectiles. Locations impacted include, waldorf, la plata, dahlgren, fairview beach, port tobacco river, popes creek, saint charles, wicomico, accokeek, bryans road, brandywine, hughesville, mason neck, potomac heights, bryantown, pomfret, port tobacco village, port tobacco, pisgah and welcome. 7/18/2016 4:05 PM EDT At 404 pm edt, severe thunderstorms were located along a line extending from 7 miles southeast of linton hall to 6 miles west of montclair to 7 miles west of stafford, moving east at 45 mph (radar indicated). Hazards include 60 mph wind gusts. Damaging winds will cause some trees and large branches to fall. this could injure those outdoors, as well as damage homes and vehicles. roadways may become blocked by downed trees. localized power outages are possible. Unsecured light objects may become projectiles. 7/16/2016 6:25 PM EDT At 625 pm edt, a severe thunderstorm was located near la plata, moving east at 25 mph (radar indicated). Hazards include 60 mph wind gusts. Damaging winds will cause some trees and large branches to fall. this could injure those outdoors, as well as damage homes and vehicles. roadways may become blocked by downed trees. localized power outages are possible. unsecured light objects may become projectiles. Locations impacted include, waldorf, la plata, port tobacco river, saint charles, accokeek, bryans road, brandywine, potomac heights, pomfret, port tobacco village, bel alton, port tobacco, faulkner, pisgah, northwood, welcome, white plains, ironsides, ripley and marbury. 7/16/2016 6:07 PM EDT At 606 pm edt, a severe thunderstorm was located near woodbridge, moving east at 25 mph (radar indicated). Hazards include 60 mph wind gusts. Damaging winds will cause some trees and large branches to fall. this could injure those outdoors, as well as damage homes and vehicles. roadways may become blocked by downed trees. localized power outages are possible. Unsecured light objects may become projectiles. 6/28/2016 7:30 PM EDT At 730 pm edt, a severe thunderstorm was located near quantico, moving southeast at 15 mph (radar indicated). Hazards include 60 mph wind gusts and quarter size hail. Damaging winds will cause some trees and large branches to fall. this could injure those outdoors, as well as damage homes and vehicles. roadways may become blocked by downed trees. localized power outages are possible. Unsecured light objects may become projectiles. 6/28/2016 7:13 PM EDT At 713 pm edt, a severe thunderstorm was located near quantico, moving southeast at 20 mph (radar indicated). Hazards include 60 mph wind gusts and quarter size hail. Damaging winds will cause some trees and large branches to fall. this could injure those outdoors, as well as damage homes and vehicles. roadways may become blocked by downed trees. localized power outages are possible. unsecured light objects may become projectiles. Locations impacted include, la plata, woodbridge, port tobacco river, cherry hill, bryans road, potomac heights, pomfret, port tobacco village, bel alton, port tobacco, pisgah, welcome, ironsides, ripley, marbury and rison. 6/28/2016 6:52 PM EDT At 652 pm edt, a severe thunderstorm was located over woodbridge, moving southeast at 25 mph (radar indicated). Hazards include 60 mph wind gusts and quarter size hail. Damaging winds will cause some trees and large branches to fall. this could injure those outdoors, as well as damage homes and vehicles. roadways may become blocked by downed trees. localized power outages are possible. Unsecured light objects may become projectiles. 6/21/2016 3:45 PM EDT At 344 pm edt, a severe thunderstorm was located over saint charles, or over waldorf, moving east at 20 mph (radar indicated). Hazards include 60 mph wind gusts and half dollar size hail. Damaging winds will cause some trees and large branches to fall. this could injure those outdoors, as well as damage homes and vehicles. roadways may become blocked by downed trees. localized power outages are possible. Unsecured light objects may become projectiles. 6/21/2016 3:29 PM EDT At 329 pm edt, a severe thunderstorm was located near la plata, moving southeast at 30 mph (radar indicated). Hazards include 60 mph wind gusts and half dollar size hail. Damaging winds will cause some trees and large branches to fall. this could injure those outdoors, as well as damage homes and vehicles. roadways may become blocked by downed trees. localized power outages are possible. Unsecured light objects may become projectiles. 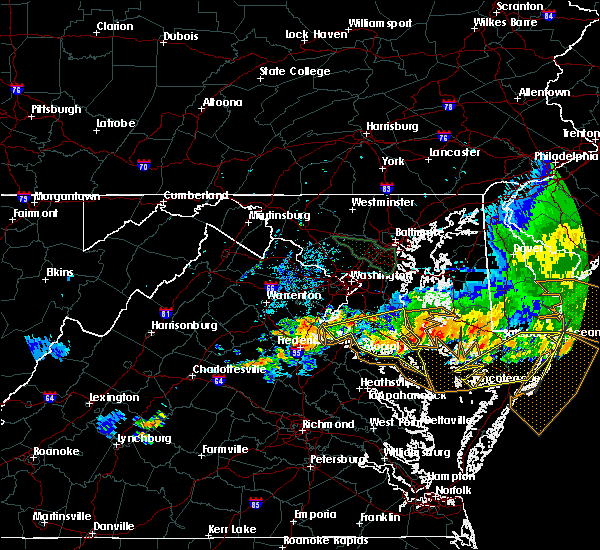 6/16/2016 9:50 PM EDT At 950 pm edt, severe thunderstorms were located along a line extending from near port tobacco river to near popes creek to near wicomico river to near colonial beach, moving southeast at 35 mph (radar indicated). Hazards include 60 mph wind gusts. Damaging winds will cause some trees and large branches to fall. this could injure those outdoors, as well as damage homes and vehicles. roadways may become blocked by downed trees. localized power outages are possible. Locations impacted include, waldorf, lexington park, la plata, leonardtown, saint inigoes creek, saint marys city, saint marys river, california, golden beach, patuxent river naval air station, hollywood, wicomico, bryans road, hughesville, mechanicsville, charlotte hall, bryantown, pomfret, port tobacco village and morganza. 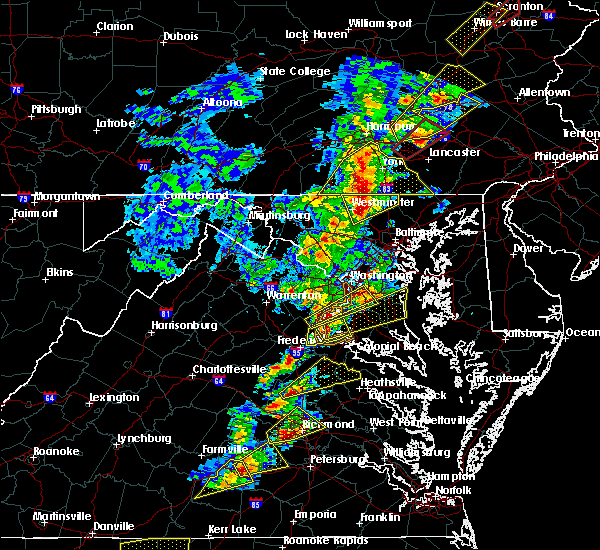 6/16/2016 9:09 PM EDT At 909 pm edt, severe thunderstorms were located along a line extending from alexandria to near quantico to near fredericksburg, moving east at 35 mph (radar indicated). Hazards include 60 mph wind gusts. Damaging winds will cause some trees and large branches to fall. this could injure those outdoors, as well as damage homes and vehicles. roadways may become blocked by downed trees. localized power outages are possible. unsecured light objects may become projectiles. Locations impacted include, waldorf, lexington park, la plata, leonardtown, saint inigoes creek, saint marys city, saint marys river, california, golden beach, patuxent river naval air station, hollywood, saint charles, wicomico, bryans road, hughesville, mechanicsville, charlotte hall, potomac heights, bryantown and pomfret. 6/7/2016 5:27 PM EDT The severe thunderstorm warning for west central charles, southern prince william, southeastern stafford, southwestern king george and east central spotsylvania counties and the eastern city of fredericksburg will expire at 530 pm edt, the storm which prompted the warning has weakened and exited the warned area. therefore the warning will be allowed to expire. however small hail and gusty winds are still possible with this thunderstorm. 6/7/2016 5:14 PM EDT At 513 pm edt, a severe thunderstorm was located near potomac creek, moving east at 40 mph (radar indicated. tree damage was reported near glendie with this storm). Hazards include 60 mph wind gusts and quarter size hail. Damaging winds may cause some trees and large branches to fall. this could injure those outdoors, as well as damage homes and vehicles. roadways may become blocked by downed trees. localized power outages are possible. unsecured light objects may become projectiles. Locations impacted include, stafford, fredericksburg, la plata, king george, dahlgren, quantico, fairview beach, potomac creek, aquia creek, port tobacco river, triangle, cherry hill, falmouth, passapatanzy, port tobacco village, port tobacco, white oak, spring valley, lambs creek and welcome. 6/7/2016 5:00 PM EDT At 459 pm edt, a severe thunderstorm was located over stafford, moving east at 40 mph (radar indicated). Hazards include 60 mph wind gusts and quarter size hail. Damaging winds may cause some trees and large branches to fall. this could injure those outdoors, as well as damage homes and vehicles. roadways may become blocked by downed trees. localized power outages are possible. unsecured light objects may become projectiles. Locations impacted include, stafford, fredericksburg, la plata, king george, dahlgren, quantico, fairview beach, potomac creek, aquia creek, port tobacco river, triangle, spotsylvania, cherry hill, falmouth, passapatanzy, port tobacco village, storck, port tobacco, white oak and spring valley. 6/7/2016 4:49 PM EDT At 448 pm edt, a severe thunderstorm was located 8 miles west of stafford, moving east at 40 mph (radar indicated). Hazards include 60 mph wind gusts and quarter size hail. Damaging winds could cause some trees and large branches to fall. this could injure those outdoors, as well as damage homes and vehicles. roadways may become blocked by downed trees. localized power outages are possible. Unsecured light objects may become projectiles. 5/14/2016 8:24 PM EDT The severe thunderstorm warning for central charles, west central st. marys and western king george counties will expire at 830 pm edt, the storm which prompted the warning has weakened and exited the warned area. therefore the warning will be allowed to expire. 5/14/2016 7:59 PM EDT At 759 pm edt, a severe thunderstorm was located over popes creek, moving east at 40 mph (radar indicated). Hazards include 60 mph wind gusts and quarter size hail. Damaging winds will cause some trees and large branches to fall. this could injure those outdoors, as well as damage homes and vehicles. roadways may become blocked by downed trees. localized power outages are possible. unsecured light objects may become projectiles. Locations impacted include, la plata, dahlgren, port tobacco river, popes creek, golden beach, wicomico, hughesville, mechanicsville, charlotte hall, bryantown, pomfret, benedict, port tobacco village, port tobacco, welcome, clements, newburg, mount victoria, dentsville and ripley. 5/14/2016 7:42 PM EDT At 741 pm edt, a severe thunderstorm was located near aquia creek, moving east at 40 mph (radar indicated). Hazards include 60 mph wind gusts and quarter size hail. Damaging winds will cause some trees and large branches to fall. this could injure those outdoors, as well as damage homes and vehicles. roadways may become blocked by downed trees. localized power outages are possible. Unsecured light objects may become projectiles. 5/2/2016 6:57 PM EDT At 656 pm edt, a severe thunderstorm capable of producing a tornado was located near la plata, moving southeast at 20 mph (radar indicated rotation). Hazards include tornado and ping pong ball size hail. Flying debris will be dangerous to those caught without shelter. mobile homes will be damaged or destroyed. damage to roofs, windows, and vehicles will occur. tree damage is likely. this dangerous storm will be near, saint charles around 705 pm edt. waldorf around 710 pm edt. la plata around 715 pm edt. Other locations impacted by this tornadic thunderstorm include port tobacco village, bel alton, port tobacco, white plains, pomfret and bryans road. 4/7/2016 5:00 PM EDT At 500 pm edt, doppler radar indicated a line of severe thunderstorms capable of producing damaging winds in excess of 60 mph. these storms were located along a line extending from near fort belvoir to 7 miles east of popes creek, and moving northeast at 50 mph. 2/24/2016 6:49 PM EST At 648 pm est, doppler radar indicated a severe thunderstorm capable of producing damaging winds in excess of 60 mph. this storm was located near popes creek, moving northeast at 50 mph. locations impacted include, la plata, port tobacco river, saint charles, wicomico, port tobacco village, morganza, port tobacco, shiloh, ninde, welcome, swan point, issue, newburg, mount victoria, white plains, dentsville, charlotte hall, bel alton, faulkner and rollins fork. 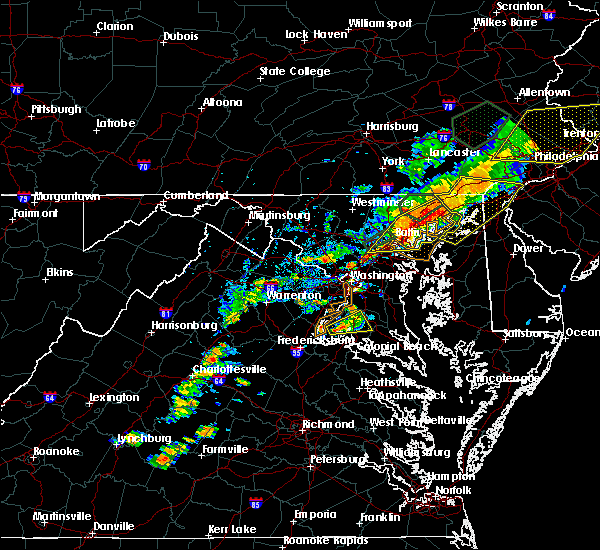 a tornado watch remains in effect until 1100 pm est for southern maryland and central virginia. 2/24/2016 6:18 PM EST At 617 pm est, doppler radar indicated a severe thunderstorm capable of producing damaging winds in excess of 60 mph. this storm was located over bowling green, and moving northeast at 50 mph. 9/9/2015 7:49 PM EDT At 748 pm edt, doppler radar indicated a severe thunderstorm capable of producing quarter size hail and damaging winds in excess of 60 mph. this storm was located 8 miles northwest of port tobacco river, and moving northeast at 15 mph. 6/23/2015 9:03 PM EDT At 903 pm edt, doppler radar indicated a line of severe thunderstorms capable of producing quarter size hail and damaging winds in excess of 60 mph. these storms were located along a line extending from 12 miles southeast of taylors island to near wicomico river, moving southeast at 45 mph. locations impacted include, la plata, leonardtown, saint inigoes creek, flag harbor, hallowing point, saint marys city, prince frederick, saint leonard creek, wicomico river, sheridan point, saint clements bay, lexington park, saint marys river, port tobacco river, chesapeake ranch estates, calvert cliffs, golden beach, california, patuxent river naval air station and lusby. 6/23/2015 8:30 PM EDT At 830 pm edt, doppler radar indicated a line of severe thunderstorms capable of producing quarter size hail and damaging winds in excess of 60 mph. these storms were located along a line extending from near saint leonard to nanjemoy creek, and moving southeast at 40 mph. 6/23/2015 8:00 PM EDT At 800 pm edt, doppler radar indicated a line of severe thunderstorms capable of producing quarter size hail and damaging winds in excess of 60 mph. these storms were located along a line extending from 6 miles south of tilghman island to 8 miles west of stafford, and moving southeast at 30 mph. 6/23/2015 7:41 PM EDT At 740 pm edt, doppler radar indicated a line of severe thunderstorms capable of producing quarter size hail and damaging winds in excess of 60 mph. these storms were located along a line extending from near rhode river to 10 miles east of bealeton, moving southeast at 40 mph. 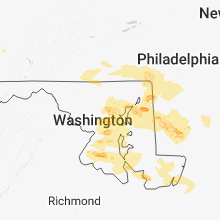 locations impacted include, arlington, stafford, bowie, fairfax, falls church, bladensburg, la plata, chesapeake beach, upper marlboro, springfield, mantua, gallaudet university, nationals park, clinton, coral hills, woodbridge, largo, fedex field, rhode river and forestville. 6/23/2015 7:14 PM EDT At 714 pm edt, doppler radar indicated a line of severe thunderstorms capable of producing quarter size hail and damaging winds in excess of 60 mph. these storms were located along a line extending from near grasonville to 9 miles south of linton hall, and moving southeast at 35 mph. 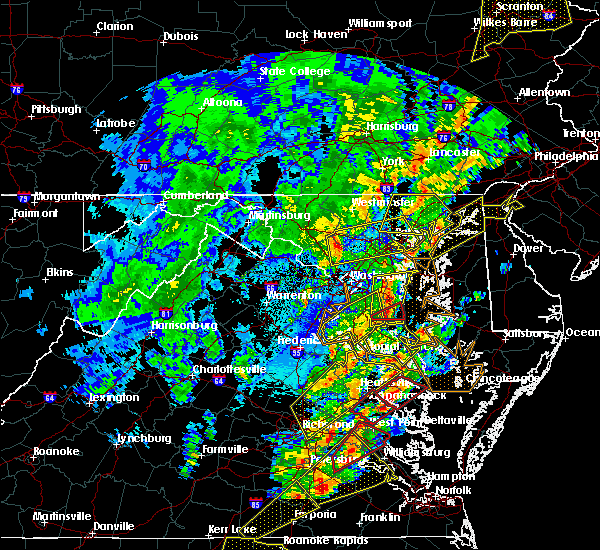 4/20/2015 8:35 PM EDT At 835 pm edt, doppler radar indicated a line of severe thunderstorms capable of producing damaging winds in excess of 60 mph. these storms were located along a line extending from near fort washington to aquia creek, and moving northeast at 40 mph.